Reality Rundown: Arrivederci, Jersey Shore! Finale - Ronnie is taken to the slammer where he spends a few hours trying not to drop the soap. Sammi of course whines at home and makes it about herself, but all is forever. And to commemorate their last Jersey Shore week, Ronnie and Sammi go for a romantic dinner in Belmar, NJ (or as I know it, home to Senior Jersey Shore Consultant Dave Robbins). Both agree it was an amazing summer and see a future for them. The future I see involves more of Sammi whining "Raaaahniiiiiiiie, staaaaaawp! ", smushing, and then doing the Ronnie dance. It's the last Goonie weekend at the Jersey Shore, and along with Labor Day comes lots of tourists. JWoww is drooling at the "gorillas" (muscle-bound hunks) at the beach, so she drags Snooki with her. The rest of the house also realizes that they basically ignored the "shore" part of Jersey Shore and spend a day at the beach. This day at the beach involves beach chairs, The Situation making hilariously creepy comments at a 5 year old's body, and likely hitting on a 15 year old. Ohhh summer! The single guys attempt to get dates for the last weekend, but shockingly not a single girl answers The Situation's calls. Vinnie, Pauly D, and The Situation have a dude's night at what The Situation calls "Chuck E Cheese for adults" and promise to visit each other. This is just like summer camp. Meanwhile, Snooki decides to call Cowboy Keith for a date and he treats her like dirt. Poor Snooki! To make matters worse, Snooki starts a solo dance party on the boardwalk only to see her ex-boyfriend, who also treats her like crap. Little Snooks is heartbroken, but the The Situation, who considers Snooki a little sister, gives her a great pep talk. But the Little Sister situation gets ignored when the two make out in the hot tub. It's kinda awkward. Vinny finally retaliates for the stink bomb The Situation left in his room by winning a giant stuffed bulldog from the boardwalk and putting it in a t-shirt that says, "The Situation's #1 Girl" in Sharpie. They worked at a damn iron-on t-shirt store, couldn't he had made an effort? The Situation initially misses it, but then has a good laugh. Even he knows he's taken a few grenades over the summer. The whole house gets together for one last family meal (not sausage and peppas, sadly) and The Situation would love for them to all get a shore house again next summer- me too!! They all cheer in happiness, I suppose forgetting all the drama. The next day, everyone moves out pretty unceremoniously but with some hugs and fond memories. It was the best summer of their lives, and the best winter of ours. Reunion - The reunion seemed less like a "Let's remember the good times!" and more of MTV saying, "Let's make these kids feel like garbage." Such clips include a montage of Snooki getting rejected by guy's, Sammi confessing she flirted with other guys, and the guys being manwhores. Everyone is looking really pale, clearly skipping step 2 of the GTL way of life. Most of the reunion seems to be everyone bickering with The Situation (Ronnie in particular). Other tidbits: Pauly's stalker drove all the way to Rhode Island to surprise him DJing at a club and Vinny still lives at home. But the best part was Angelina (who?) getting served because apparently she has previously hooked up with The Situation. Aw snap! Meanwhile, Angelina shouldn't even be there because she was in the house 2 days- you're not one of them!! Angelina also pipes in that Ronnie is the best dancer and Vinny is the best fist pumper. Again, you were there 2 days so maybe she's just commenting from the TV footage she had to watch in regret because she's not famous and they are. Overall, the reunion was kind of a waste of time since we know everything about them since the show ended. A season 2 is definitely coming but whether it's the gang we love of a bunch of new guidos and guidettes that will likely just try to top the originals, we'll have to wait and see. 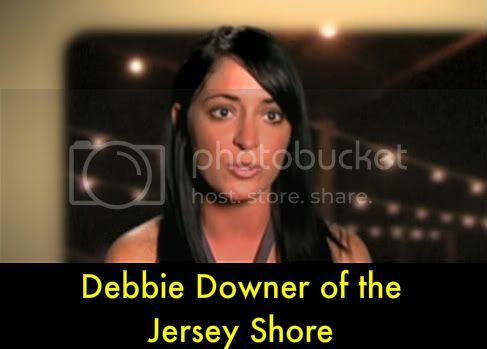 Just don't bring back Angelina the Debbie Downer of the Jersey Shore. My name is Elisa Coles I was browsing internet and found your blog. The author did a great job. I will subscribe to your RSS feeds. Thank you for your contribution. I am a web designer myself. And here some examples of the websites that I designed for payday loans canada cash advance company.